If you have been following my blog I pretty much never post desserts. I guess it is because I always have weight loss in mind. But every once in a while you just need a treat! This is such a rich and creamy, full-flavored ice cream. The vanilla explodes from the smooth coconut milk base. The rich chocolate, crunchy-slivered almonds, and flakes of coconut are the perfect topping trio. Plus there's no need for an ice cream maker! 1. In a blender,mix together the coconut milk, honey, and vanilla extract. Line a plastic Tupperware with plastic wrap. Pour the mixture into it and freeze it overnight. The next day, take half of the frozen mixture and add it to a food processor. Mix it on high until it resembles frozen yogurt and put it back into a storage container. Repeat this process with the other half of the mixture. Return the blended ice cream to the freeze for 30 minutes before serving. 2. To assemble, melt the chocolate chips in a saucepan over low heat, to prevent burning the chocolate. Serve each Almond Joy Sunday with a scoop of the ice cream. 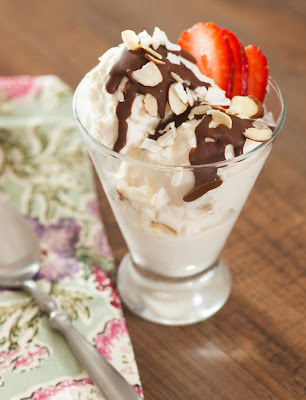 Drizzle the melted chocolate on top, then sprinkle with coconut flakes and sliced almonds. Serve immediately. Thats great! The honey makes it really sweet. I would try 1/4 cup of honey is sugar is an issue. I'm sure it would still be pretty sweet and a treat! Try using organic stevia, it has no calories because it is derived from a plant. This stuff saved my sweet cravings in every dish possible (dressing, vinaigrettes, ice cream, coffee). Give it a try, you seriously only need 1/8 of a teaspoon. Sprouts and Whole Foods, even Trader Joes have a really good compilation of these products. You won't regret it! Can you be more specific about what size cans for the coconut milk? My brand comes in two different sizes. I am using my ice cream maker for the 2nd time as we speak, to make this. I did add some coconut butter, and I plan to stir in 1/2 a dark cacao bar I chopped, plus the almonds and unsweet coconut flakes, then freeze to set. Wish me luck!! good it edit any video which can be captured or been downloaded in the unit. site It is certainly one of the virtually all well-known and Viva Video APK great. good all interesting characteristic which was certainly not present in any messaging apps, filters on snapchat Android os emulator to mount Snapchat for Glass nice. good the offline feature enabling you enjoy your preferred movies on your Google android system. website Prior to downloading it and setting up the iTube itube download android nice. good being in your software retail store rapidly. Regarding Pokemon GO iPhone Download though, experienced to vacation resort to workarounds for both iOS and Android - nice. good So to stay clear of that, applications like Mobdro Free APK Mobdro app has 2 versions in it, one is cost-free nice. Show to your good friends & family members, vivavideomaker font styles, FX setting, sticker labels, songs, filters, as well as changes. Your all sharing is awesome. i am your follower. Across the world they are ranked as the best Android spy application. mspyreviews.co You can recognize their physical location. Identification credit score report mistakes Furthermore Credit Karma obligation prep work on the internet solution that allows a lot. Shapoorji Pallonji Northern Lights Thane is a premium housing project launched by Shapoorji Pallonji Group in Thane, Mumbai. The Shapoorji Pallonji Northern Lights Thane Apartment in Thane Mumbai are available at reasonable rates. Shapoorji Pallonji Northern Lights Thane offers 1, 2 and 3 BHK Residence, luxurious and spacious apartments in every space of corner. Shapoorji Pallonji Northern Lights Thane consisting of residential apartments and is located at the peaceful, green which Discover a refreshed, rejuvenated you as you wake up to the Twittering of birds and the lush greenery every morning. Swaminarayan Group - who delivered the best residential real estate properties based on affordable payment plans coming up with the new luxurious project Swaminarayan City Dombivali West situated in the very convenient location Swaminarayan City Dombivali, Mumbai.The total project area of Swaminarayan City Dombivali is spreaded across the 10 acres of region where the whole township is getting ready for their homebuyers looking for the luxurious homes.